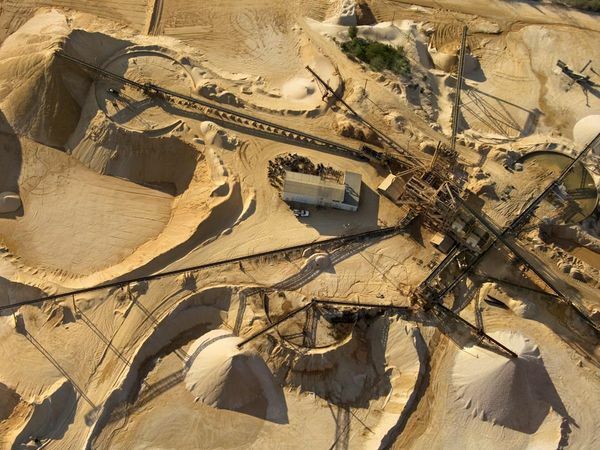 About 95 per cent of the world’s opals are mined in Australia’s Red Centre. But scientists now believe they might also exist off-world on Mars. Scientists believe that Mars may have weathering conditions conducive to opal formation similiar to that of the Earth’s ancient past. Climactic conditions that created opal in Australia roughly 100 million years ago closely resemble what scientists know about Mars. Australia’s Great Artisian Basin, once covered by an inland sea, began drying out about 100 million years ago. As this regressed an period of acidic weathering occured, caused by the exposed pyrite minerals, releasing sulphuric acid. As the surface cracked, silica-rich gel became trapped in the veins in the rock, which was later covered and protected from weathering by secondary minerals. This allowed the silica to solidify to form opals. The only other area where similar conditions have been observed is on the surface of Mars. Scientists, with the aid of advances in technological research, have discovered direct physical evidence of the existence of Martian Opal found in a Meteorite that fell to Earth from Mars in 1911. Traces of the opal known on Earth as fire opal could very well be an indicator of the existence of microbial life on the surface of Mars. Opals are often found around hot springs where microbial life can thrive, gemstones can trap and preserve these microbes for millions of years. 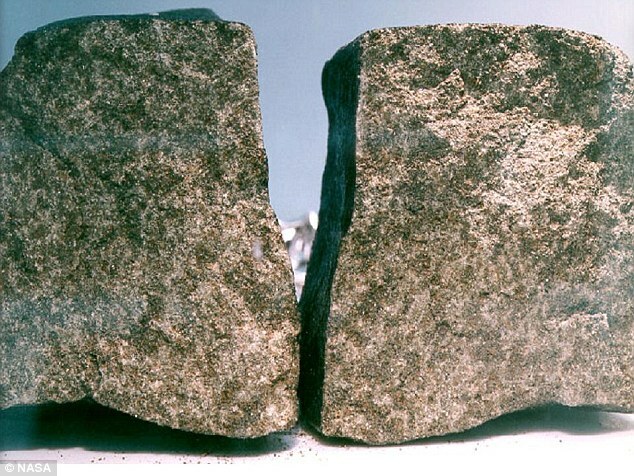 The volcanic rocks that make up the meteorite are 1.3 billion years old. 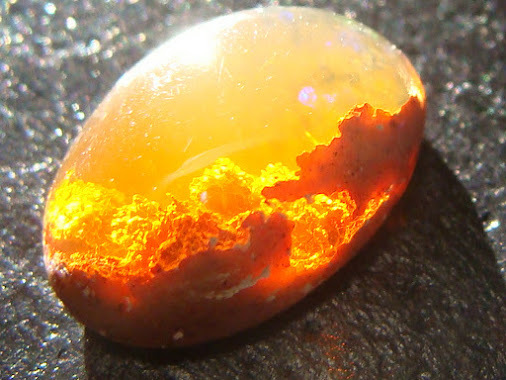 The opal was discovered in a portion of Meteorite known as Nakhla, supplied by the Natural History Museum of London by a University of Glasgow team. As well as physical traces of secondary minerals created by water interacting with the minerals olivine and augite. Nakhla was named for the Egyptian town El Nakhla El Bahariya where it was found in 1911, having been ejected from Mars by a massive impact of as yet unknown origin. Supporting the Bid for the existence of Martian Life, several years ago, the Mars Reconnaissance Orbiter revealed Martian rocks containing a hydrated mineral similar to opal, likely created by the interaction of water with silica. The cumulated data, from rovers, orbital missions and earth-based analyses of Martian meteorites, is providing yet more evidence of Mars’ geological history. It is the first time that a piece of Mars on Earth has been found to contain opal. It is also supportive of the theory that Water once flowed freely on the Red Planet. Mars appears to be a dry, barren planet, but the alien world is also remarkably humid, this humidity could be enough to support life, but only if if the water condenses to form short-term puddles in the early morning hours. The discovery of fire Opal fragments within the meteorite is significant due to the fact that it corroborates findings from Nasa’s imaging and exploration of the Martian surface which appeared to show deposits of opal. If Martian microbes existed, it’s possible they too may be preserved in opal deposits on the surface of Mars. Closer study of Martian opals by future missions to Mars could well help us learn more about the planet’s past and whether it once held life. Previous PostThe future of warfare is Here!Next PostThe Planet of the Apes is Now!